A current focus of the research of the British Columbia Aboriginal Child Care Society (BCACCS) is the gathering of documentation interviews that explore singular commitments to Indigenous early childhood care, development and education. This is for use for curriculum, pedagogy and cultural safety in early childhood education and professional development, for the sharing of research in embodied and narrative ways, for public policy advocacy on behalf of Indigenous children, families and communities, and to help inform and direct the BCACCS research agenda. We are documenting a diversity of voices in a common effort to inquire into, share about, celebrate and represent what is important in Aboriginal early childhood care and education (AECCE). In developing this generative and culturally responsive approach to collaborative research, we have been engaging AECCE workers and administrators, parents, Elders, community leaders, scholars and policy-makers in participatory video interviews. 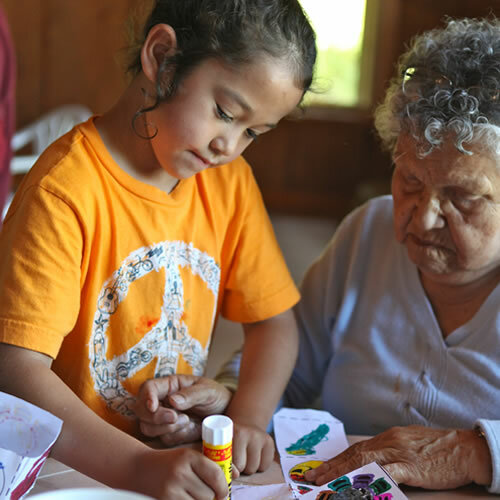 Although the BCACCS research agenda specifies a number of areas in which to pursue research with and among communities involved with First Nations early childhood care, development and education, a collaborative approach to inquiry begins with participants’ own needs, wishes and areas of concern. As a participatory approach, we invite participants to suggest any themes, issues, questions, or stories they might want to consider for a documentation conversation. They are asked what they feel needs to be said about AECCE, about the care and raising of First Nations children (and its many contexts, challenges and unique strengths) as well as their own particular commitments to and experience in it. These ideas form the basis of our documentation, conducted in one or more video recorded interview(s). These can arise from specific projects in specific communities, or speak more generally to our field. Documentation conversations are typically around 30 minutes in length of what we call ‘searching discussion.’ No footage is used without prior review and consent by participants, and interview footage is available for participants’ use, with or without BCACCS’ later involvement. In some cases, participants take advantage of the process for their own documentation purposes. We at BCACCS feel that a great deal needs to be said, shared, celebrated, and sometimes struggled with about the care, education, circumstances and prospects for First Nations children. We are honoured to be permitted to share the diverse strength of engagement with these concerns, in the hope that we may help to create ways for Indigenous peoples who support the gifts that children bring to be at the forefront of changes to come. Our approach in this research is informed by Margaret Kovach’s (2010) elaboration of a ‘conversational methodology’ as a form of indigenous research (see also Indigenous Methodologies: Characteristics, Conversations, and Contexts, 2009), Jo-Ann Archibald’s (2008) development of Indigenous Storywork, as well as the work of Sinclair et. al. (2015) on participatory video making in “research and health promotion” among Australian Aboriginal communities. These inspirations broadly inform an effort to decolonize research and allow for a space for specifically Indigenous emergence as, and in, practices of inquiry, to the benefit of children, families, communities and First Nations and in their guidance.